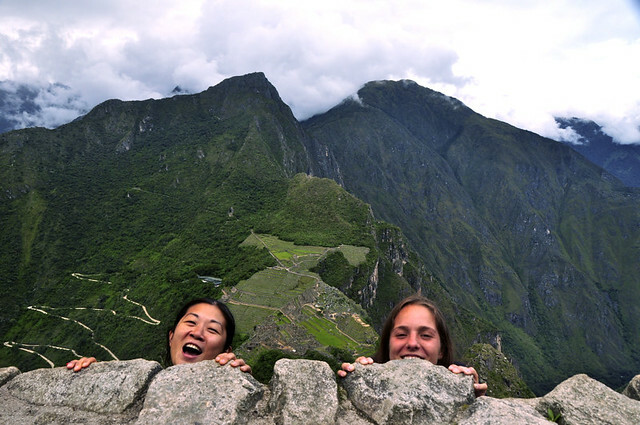 Now seriously, just because you won’t half kill yourself, doesn’t mean you’re not gonna find Machu Picchu magnificent. Why do I say this? Because when you are in Cuzco, all everyone is talking about doing some kind of trek getting to Machu Picchu. I don’t mean to walk the the Inca Trail. But all this obsession of trekking, you almost forget that they already built a railway that makes getting to Machu Picchu without sweating. At first, I’d even feel a bit embarrassed to say that I’m going to train it instead of trailing it. Then I thought, what the hell? This is my trip! I would do the Inca Trail because of its historical value, but as I mentioned in the previous post, I didn’t know you have to book it way in advance. It’s not on my bucket list to walk it, but if I have the chance to do it in the future, I would. But now that I’m in Cusco, I don’t have to give in to any of the alternative treks. Ok maybe I’m a bit jaded at this time with the Colca Canyon trek fresh on my mind (and jelly legs). Just saying that I cable car’d to The Great Wall of China, bussed to Petra in Jordan and they were still absolutely grand. 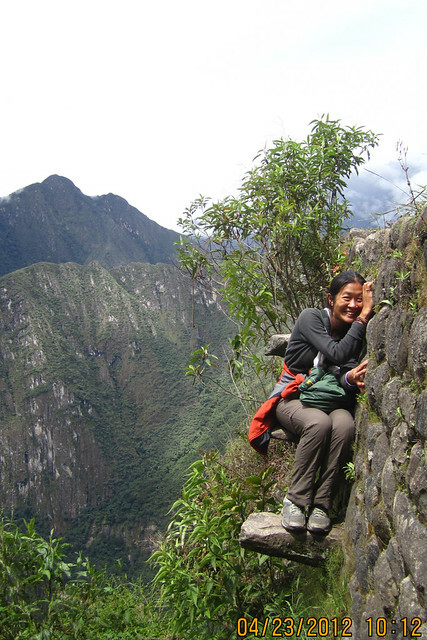 Plus, getting to Machu Picchu, you would need all your energy to explore the massive area and climb Wayna Picchu. A reviewer in Trip Advisor said that he somewhat regretted doing the trail because he was so tired when he got to MP, he didn’t have anymore energy to explore the massive area. He said that he hope to go back to Peru one day and he’ll definitely train to Machu Picchu. I’m so sold. So if you’re sold as well, here is how you get to Machu Piccho by train from Cuzco. 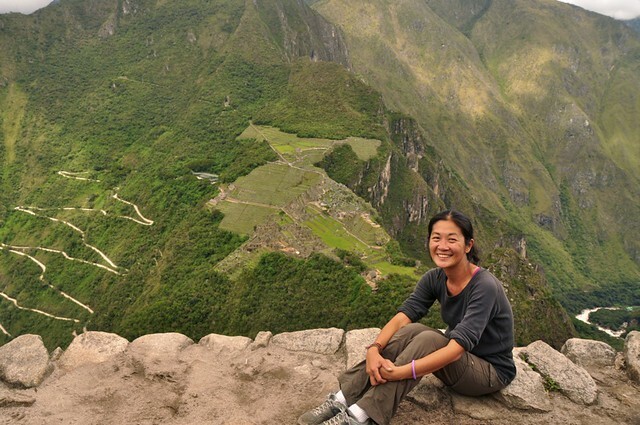 Buy your Machu Picchu (and Wayna Picchu) ticket which you can only do in Cuzco. Used to be you can get it on Aguas Calientes, but not anymore. Get on a bus to Ollantaytambo. It costs 10 soles and takes about 1 hour. Get on a train in Ollantaytambo to Aguas Calientes the town below Machu Picchu. You can buy ticket in Ollantaytambo but advisable to get it in Cuzco to secure the time slot you want. The ride takes about 2.5 hours. It costs $37. You can spend one night in Aguas Calientes as it’s a colorful little tourist town with many restaurants. It has hot spring, ergo the name of the town. You can climb the 1,800 Inca steps at 4.30 a.m. that leads to Machu Picchu. You get there at 6 a.m. in time for the opening of Machu Picchu. If you’re lucky, you’ll catch the glorious sun rise. If not, then it’ll be foggy but it’ll pass fast. Because the 1,800 steps will be a bit@h to climb, then know that the 1st bus that takes you all the way to the MP entrance leaves at 5 a.m. Return ticket costs USD17. If you’re not in a tour with a guide, I suggest you hire one available at the entrance. I was with a group. You can explore the nooks and crevices on your own, but you’d want to know the story and what they mean. Even if what they’d tell you are based a lot on archeological guess work, you’d want to be in on the loop. The Incas Empire lasted for about 100 years ending at the arrival of the Spanish in 1530s, which makes it a relatively recent history. As sophisticated as the Incas’ were, they never invented a form of writing, so there is no written record of Machu Picchu anywhere. In fact, with all that they learned from Machu Picchu city, scholars still doesn’t know what its original name. They called it Machu Picchu, the Quechua term for old mountain and Wayna Picchu meaning the young mountain. Our guide said Machu Picchu was built by 2,000 workers but only 300 people lived there, although I missed the explanation how the scholars learned that. MP is like a astrological and scientific center where only royalties, scholars, and religious people lived. It took them 60 years to build but only lived there for about 100 years. They fled when the Spanish came in the 16th century. As there is no written record, that is the assumption. It’s quite a shame that they left because the Spanish didn’t even discover this place. They could have plotted against overthrowing the Spanish sooner there. You can’t slip a paper between the blocks. They also don’t cut big rocks. Just build around them. MENTAL! You probably got the idea that I’m not such a fan of climbing but I would strongly recommend that when you go, you include Wayna Picchu on your agenda. It requires some sort of climbing and walking for 1.5-2 hours and it’s a tough and scary one! There are bits where it’s steep and narrow and that you have to crawl or pull yourself up. And by the look of it, if one falls, one dies. So be really careful. I obviously survived it so I’d say everyone can do it. There’s a limit of 400 person per day in WP, so sometimes you have to wait (if you didn’t book your trail in advance). For example, if we had booked our ticket on the day we arrived in Cuzco, which was a Wednesday, we could have had the ticket for Saturday. But because we weren’t sure and waited for the following day to do it, the soonest schedule we got was Monday. I would say that I truly appreciate the extraordinary civil engineering of this ancient citadel when I saw it from Wayna Picchu. It’s so surreal to see a complete city built in the middle of mountain ranges without the use of modern transportion facilities. Everything had to be brought in by human and donkeys though the hairpin like Inca Trail. Machu Picchu is super impressive. The ruins, staircases, terraces, temples, palaces, towers, fountains, stone works are amazing as it is. Now imagine that they were built before any modern equipment were available. It just blows your mind away, doesn’t it? We paid tribute by staying in there for 10 hours climbing and visiting all possible nook and crevices of the city. It’s a labyrinth and we imagine it must me amazing for the kids to grow up here and have Machu Picchu as their playground. Hi there. Thank you for a wonderful blog. My friends and I are planning to go to Peru and Argentina. In Peru, the main interest is Macchu Picchu. Right now, our main issue is whether to book a tour from the Philippines or just go to Peru, Cusco, Agua Callientes, and then get a tour from there. These are my questions and I hope you have time to answer them. 1. Is it okay if we just book a flight to Cusco, stay there for one night, go to Aguas Callientes, stay there for one night then just go to Macchu Picchu via train (I totally agree with you!!!)? 3. Do we have to book hotels in advance in Cusco and Aguas Callentes because there might be no vacanacy if we just arrive there? We plan either to go in March, July, August, or November. 4. Not to impose too much on your kindness but do you have other info and practical tips for Lima and Argentina (we plan to go to Buenos Aires, El Calafate, and Patagonia)? 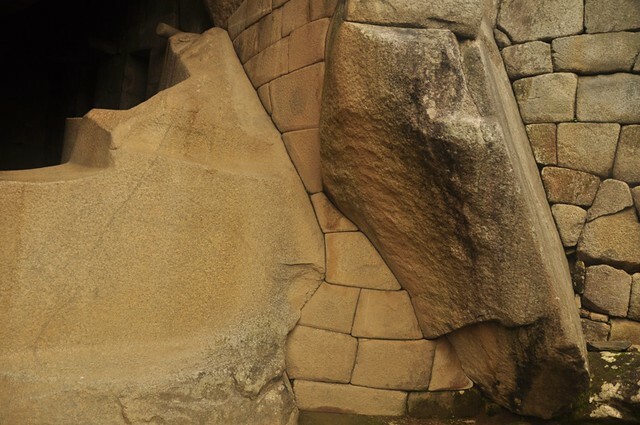 I am glad to find this blog about Machu Picchu! I might go there next year. Your photos only proved that this is a must-see place! You are a one brave lady to do that pose (the last photo)! lol.. This Machu Picchu is always in my dream list.. Thanks for sharing your experience! the last pic IS really cool! all the best…happy for you! Many Chinese people are learning English and can speak them quite well. I am totally envious! But i am very happy for you, at least you are from my country and i don’t depend anymore on some foreigners posts. And OMG, how so brave of you to do that pose, that i cannot do in this lifetime! Is there really no anything to hold on to reach that rock you are stepping on, there should at least have a rope. I am holding my breath just looking at you! When are you coming back home!?? ?